Thug Motivation 101: Just Start. Again. So I’m writing this as an addendum to Just Start. It’s the middle of January, which is the time when we start moonwalking back into our same ol’ routines after promising big things for the new year. We start projects and we stall on them three weeks later, even if we’ve got the best intentions. Taking action on something doesn’t mean it will get completed, or even pass the napkin-planning stage. So what do you do when you’re ready to ‘show up and show out,’ but you can’t find the Muse or the motivation to start again? I STRUGGLE WITH THIS PROBLEM A LOT. My smart phone is my biggest enemy. I flick through Pinterest boards for an hour. I check, then re-check my various email accounts. I update my Twitter feed, knowing I have no intention to post a tweet. I’ve lost many hours because I chose my smart phone instead of choosing to do my creative work. While waiting for the muse, it’s better for me to put my pen to paper instead of putting my fingers to the touch screen. How do we get back on track? How do we get the motivation to ‘Just Start’ again? The solution lies in being mindful. And in honoring the quiet nudge you get from yourself when you realize you’re in la la land. It could be 22 minutes before you realize you’ve spent a little too much time scrolling through your favorite social media feed. Don’t beat yourself up about it. You’ve already won because you recognize the discrepancy in where you are from the place where you’ve agreed to meet your Muse. Gently remind yourself that you should be creating. Pick up where you left off. 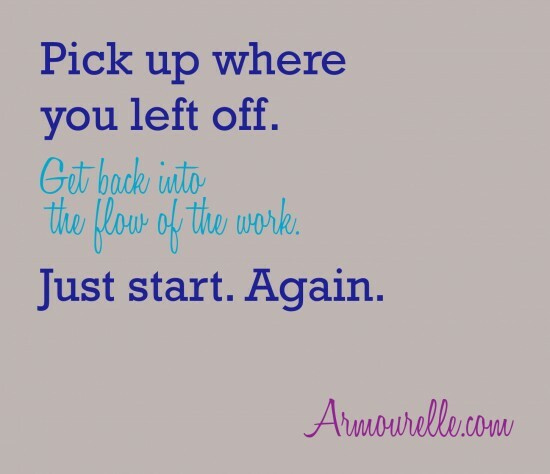 Get back into the flow of the work. Just start. Again. *Stephen King writes in his book On Writing: A Memoir of the Craft, that the Muse will meet us eventually–if it knows where to find us.